While we proudly lay claim to our role as one of earliest proponents of a formal field focused on Enterprise Engagement, we did not originally envisage it as a social movement. Likewise, while most of the corporations long dedicated to what we call Enterprise Engagement without calling it that – companies like Big Y, Chick Fil A, Container Store, Market Basket, Mary Kay Cosmetics, Starbucks, Stew Leonard’s, Wegman’s, Whole Foods and many others – believe that part of their role in business is to create opportunities for their customers, their employees and their communities, like-minded companies have only begun to work together to promote values-based management. Probably the most notable example is an organization called Conscious Capitalism, which addresses even broader issues than Enterprise Engagement in that it also involves sustainability and a “higher purpose” in doing business that goes beyond our narrower focus on how organizations can implement a sustainable engagement strategy with a clear return-on-investment. Another example of an advocacy group in the U.S. is the Engagement Institute, the Conference Board’s organization. To the best of my knowledge, the concept that engagement specifically is good for society at large, and as such is actually a movement, came out of Great Britain. David Macleod and Nita Clarke, among the founders of an organization known as Engage for Success conceived during the last years of Labor Party government but embraced by the conservative government of David Cameron shortly after he first took office in 2010, first postulated the broader social benefits of engagement in Well Being and Employee Engagement: The Evidence White Paper, produced in the organization’s earliest years. Macleod is the first person I’ve heard call this a movement as well as a field. He and his colleague Clarke assert that the benefits go well beyond better performance for organizations and happier employees and more contented customers, but spread out with positive effect into the homes of happier employees, and into the job market because companies that engage are often more successful, pay better and create more jobs, which in turn promotes greater general prosperity. So what does this have to do with Pope Francis? Based on growing signs that engagement is at the tipping point, the Pope just might be right. Who knew that Pope Francis had business instincts as well? Perhaps it was his early training as an engineer. 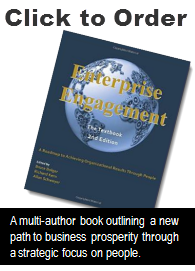 The engagement movement, as we originally defined it, is a practical approach to conducting business, not a movement. For organizations, it’s simply a framework and field of expertise for achieving critical goals, such as branding, advertising, direct marketing and other business fields. A movement is something more – it’s a general conviction that there is a cause or opportunity that requires concerted effort to accomplish that goes beyond the practical methods we outline in our Enterprise Engagement textbook and curriculum for engaging people to achieve specific results. I’m not sure if being a movement is good or bad, but as a movement, engagement has some unique benefits. Its premise is difficult to counter – who can argue with a business model that satisfies the needs of customers, employees, shareholders and everyone who touches an organization? It’s nondenominational and apolitical, and its premises, framework and implementation process can be used to further any organization or cause on the right or left, and government intervention is not required. I commend Macleod and Clarke for having the audacity to proclaim this a movement. Perhaps that’s the advantage of having the backing of their nation’s Prime Minister. Engagement is one of those rare movements upon which almost everyone can agree, except maybe for those few hardened cynics who will never believe that any good can come from capitalism or engaging people. Those who believe that greed is the ultimate motive should actually be heartened by the engagement movement: Research proves engagement will appeal to those deepest darkest elements of greed because companies that strategically engage over time create more wealth, prosperity and happiness for almost all who touch them.